If you want a good day’s ride to take you away from the Algarve coast and up into the hills through some gorgeous scenery then this circuit is an excellent option. Like the Monchique Explorer (see separate page), it could also be split into two days with an overnight stop if you want to take more time. The full circuit is tough but can be shortened and made easier. 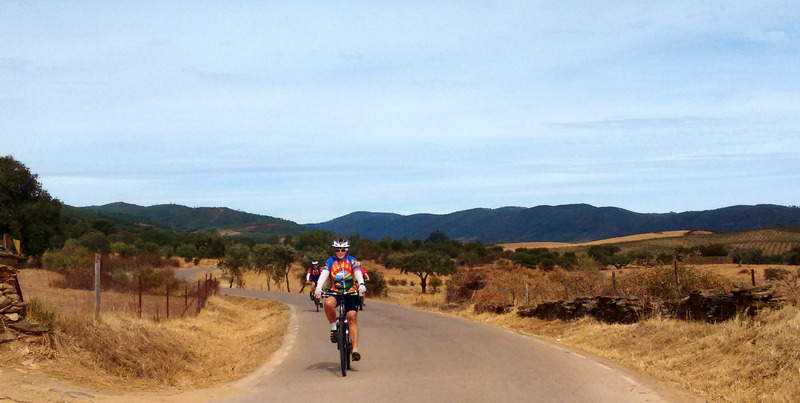 Cycle touring near Alte – pic courtesy of Esther Tacke & Warren Sanders. Race fans might like to know that the toughest part (up to Malhão) also features in February’s Volta ao Algarve in which the riders do the climb – twice! 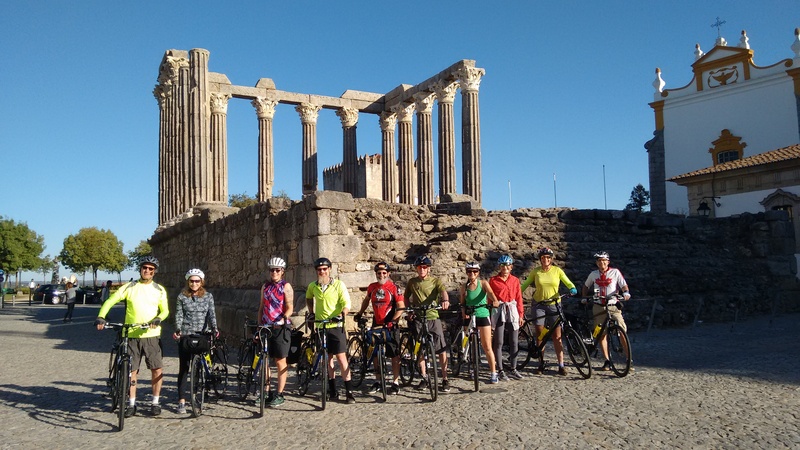 Alternatively, you might be more interested to know that the ride also takes you via one of the Algarve’s prettiest villages and past a beautiful area of limestone formations known for its wildlife, views and climbing. This ride is another contribution from fellow cyclist Andy Smallwood. 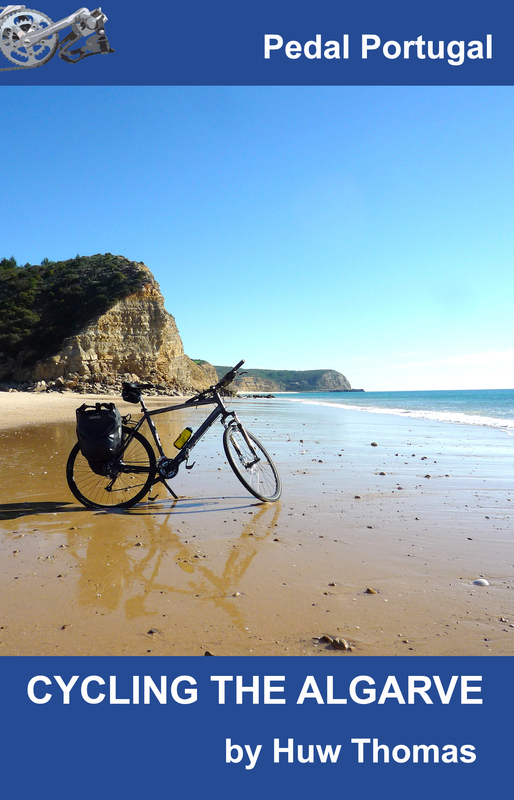 Note: If you’re interested in touring in southern Portugal, the image above comes from The Sportswool Diaries, a blog from riders Esther Tacke and Warren Sanders about their ongoing quest to find the nicest places in the world to cycle. Which, needless to say, includes Portugal. Total distance is 80km (50 miles) and if you complete the whole ride in one day then it’s going to be fairly tough (see the elevation profile below). There’s also a good bit of climbing involved – from about 70m above sea level to around 500m, with a total ascent over the ride of just over 1,500m. However, if you want to make life easier on yourself there are a couple of options. One is to take the N124 direct from Alte to Salir – missing out the whole section around Malhão – which will reduce the circuit to 64km. The amount of climbing is also greatly lowered – down to a maximum height of about 280m (920ft). Buddhist stupa – and amazing views – near Malhao. Alternatively, you could just leave out the climb to Malhão itself (see below). This only cuts off about 8km but – more significantly – removes a climb of about 200m (660ft) and the steepest ascent, which has an incline of almost 20%. As mentioned in the introduction, the other option is to take more time and split the ride into two days – Alte, Boliquieme and Loulé could all be used as overnight stops depending on where you start. If you’re looking for a base, then Loulé, Boliquieme and Alte all offer accommodation options. 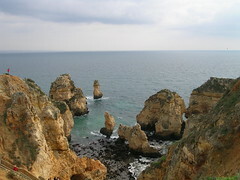 Alternatively, Albufeira and Quarteira on the coast are popular holiday options – although many places will be catering for people after more than an overnight stay. There are also big supermarkets and plenty of shops, cafes and restaurants in Loulé, which is one of the area’s main towns. Otherwise, apart from recommendations already mentioned in the details above, Boliquieme and Alte offer various cafes, shops etc. The ride shown starts from the railway station at Boliquieme, although Loulé would probably be equally convenient for most people. On leaving Boliquieme, you begin by riding through a mixture of farmland and villas towards Paderne. After about 5km though, you’re into pure countryside and it’s very quiet with minimal traffic. You’ll cross the A22 Lisbon motorway, after which the road will begin to climb a little over a low ridge. 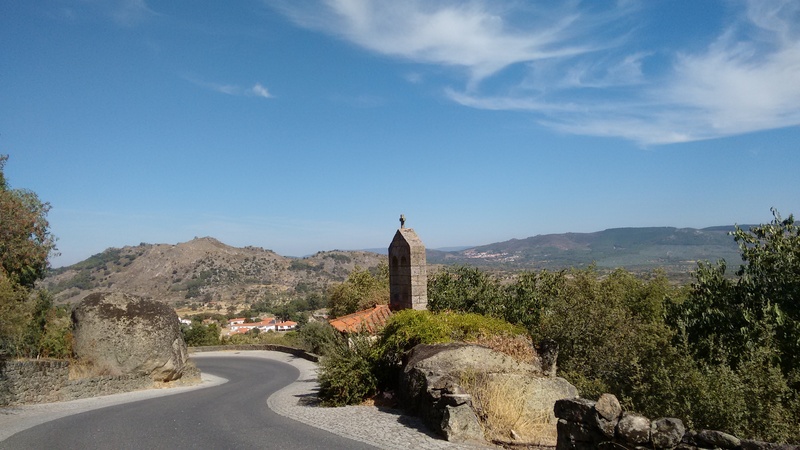 It then drops back down towards the village of Paderne and a bridge over the Ribeira da Quarteira – next to the wonderfully named hamlet of Purgatorio. Head north, take the next right and then follow a series of quiet lanes as you start to climb towards Alte. When you reach the N124 at the top of the hill, turn left to visit the village before doubling back on yourself to head east. If you want a faster and slightly gentler route to Alte and don’t mind a bit more traffic, you can just follow the N270 north-west from Paderne and then go east along the N124. From Alte, continue for another 5.2km to Benafim Grande and turn left. Off to your right is the Rocha da Pena, a beautiful area of limestone pavement and karst formations that are popular with wildlife enthusiasts and climbers. Continue north, following the signs to Malhão – turn right when you join the M542 and then left at Cortinhola. You’ll start with a brief downhill but this is followed by a very steep climb to Malhão, so make sure to have a low gear on the bike. At the top, a track to your right will take you off to an unusual site in Portugal – a Buddhist stupa, which also makes a fantastic viewpoint. There’s a life-saving cafe here – often with other cyclists having a well-deserved rest and coffee, so join them and enjoy the views! Just a little further along from the cafe is the village of Malhão. Anywhere round here is great for photos, or simply taking in spectacular views across the Alentejo, Portugal’s largest and flattest region. Turn round here and enjoy whizzing back down to Cortinola, where you now turn left. On the way back towards the coast, it’s mostly downhill to the village of Salir – the cafe on the right as you go through the village does good pastel de nata! 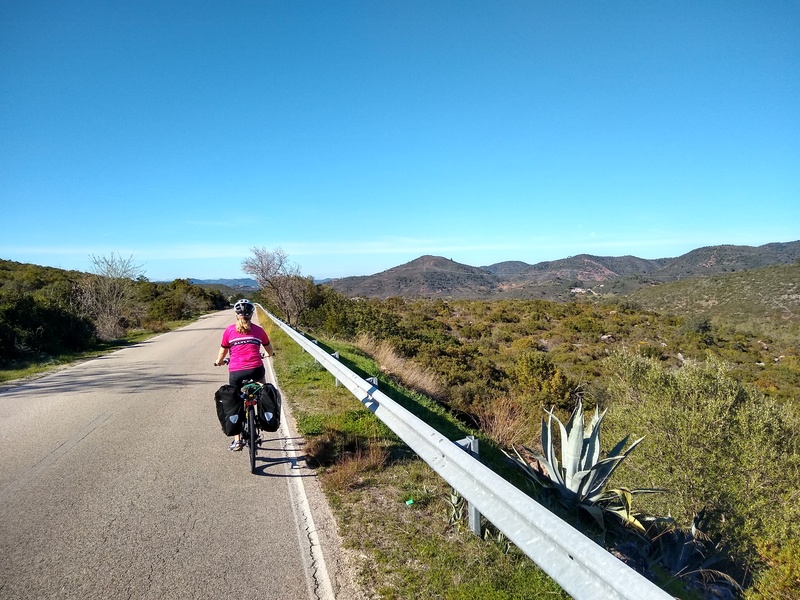 From Salir, it’s a rolling route through the countryside with a few hills but nothing to compare with Malhão – ending with a good downhill into the large town of Loulé – again worth a wander around, especially on market day. From Loulé, it’s around 15-16km back to your starting point. If you want the flatter option, simply stay on the N270 until you get back to Boliquieme, although this can be busy in parts, particularly with lorry traffic coming in and out of a large quarry. If you want to use much quieter side roads, the map shows a route through a series of small lanes. Be warned that there’s another stiff climb up over the hill at Picota, although the views from the top are wonderful. *The descent from Malhão to Loulé also features as part of this site’s Alentejo to Algarve touring route. Sorry for taking so long to respond but have been away with limited access to internet. Haven’t got any brilliant ideas. Problem is IC1 – you wouldn’t want to ride this but there’s no simple way from your area to Monchique to the east of IC1 (not that I know of anyway). Basically, you need to get to Silves before heading into hills. There’s the back road via Alferce, which is a great climb. Alternatively, longer route is from Silves to Sao Marcos da Serra and then west on N267. I rode this in January a few years back. Lots of hills but little traffic and a great ride. I reckon we may try the EN125 then the 269 to Silves and give the Alferce route a try ­ I¹ll send you the route (and the results) on Strava! Personally I’d avoid the N125 if at possible. It’s been improved a lot over the last couple of years but it’s the main east-west route across the Algarve and has a lot of traffic, including lots of trucks and other commercial vehicles. There is a shoulder most of the way but it won’t be a particularly peaceful or scenic route.